The Pet Shop Boys release their new single, 'Did You See Me Coming? ', through Parlophone Records on 1st June. The track is the second to be taken from the boys' top 5 album, 'Yes'. The single formats feature brand new tracks, 'After The Event', 'The Former Enfant Terrible', and 'Up And Down', which do not feature on the album. There is also a new mix of album track, 'The Way It Used To Be' by Richard X. The BRITs medley, produced by Stuart Price, will also be released in one of the digital bundles due to popular demand. 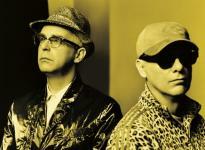 The Pet Shop Boys kick off their world tour in Russia on 10th June. They play Manchester Apollo on 18th June and London's O2 Arena the following night. Both UK dates are sold out.